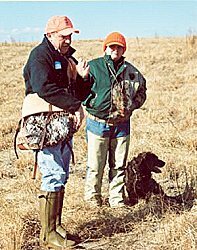 The first Boykin Spaniel Society Upland Hunt Test was a three-day event. It began on Friday, with an all day seminar given by Ray Cacchio and culminated with a live flyer, water double - using mallards - on Sunday morning. The weather was cold and windy. It was perfect for our northern guest judges, but a little on the chilly side for most of us southerners. The temperatures peaked in the 40's on all three days with wind gusts bringing the chill factor down into the 30's. Mr. Cacchio's seminar on Friday was very informative and fun. Most of these Boykins are used as non-slip retrievers, so Friday was the first time that any of them attempted to quarter in order to find game. You could almost see the wheels turning in little brown heads when the pups got the idea of the game. 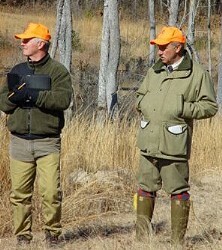 Each participant was given an opportunity to work their pup on quartering and steadying to the flush. We all learned how to get our pups to turn and keep tabs on the handler without the use of check cords or e-collars, but just by walking away from the dog. This technique works best with dogs that have bonded with their handlers and who become concerned if left behind. The dogs who made eye contact with their owners were the ones that Ray liked to work with the most. Pups who wanted to play with their birds or run off learned to come in. Sometimes it was near miraculous to see such immediate results. We often use our whistles and fuss over our dogs too much, which makes the dog anxious. Relaxing and letting the dog learn to work with the handler is the key to unlocking the joy of upland hunting. The hunt test started on Saturday morning with the Open class. The cover was too sparse for pheasants, but it was perfect for chukars - the bird of choice for the weekend. Mark Fulmer, of Sarahsetter Kennel, was the bird planter for the hunt test and the judges kept him moving all day on Saturday. 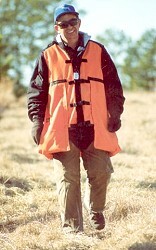 This is one of the most important jobs of any hunt test. Knowing how to plant the birds in order to keep them in the area - yet alert enough to flush - is not as easy as one might think. Mark did a great job.